In some cases we need to bind Enum data into a DropdownList. 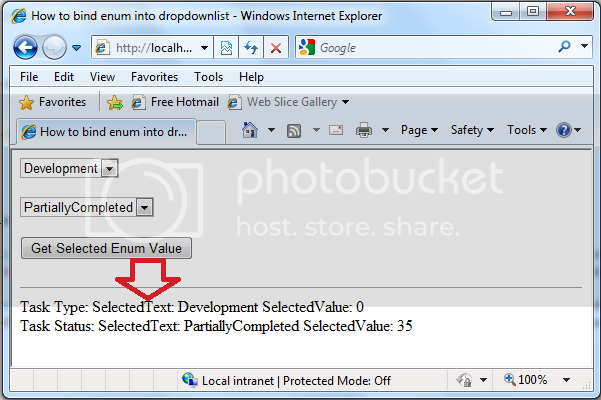 So in this article or tutorial i will explain "How one can bind enum into a DropdownList in Asp.net". After searching a lot of time i found all codes are inline but i want to control enum from a single class. So that i can manage enums from a single file. As a developer we need enum in most cases like Status,Type etc. So that i want to encapsulate all my necessary enums of my project into a single class. Here i will show you how you can easily manage enums in your project and use multiple times in your pages where required. If you can not understand what i am telling then follow the below complete example. Hope now you can easily manage all enum types from a single class file and use in your pages when required.